If you planned on picking up 5TH Cell's type-em-up DS game Scribblenauts, you might want to consider putting in your preorder now at GameStop. If you want a rooster hat, that is. Between this and the Mario hat available to Platinum-level Club Nintendo members, Nintendo gamers may have the next two Halloweens in the bag. So far, the hat is only available for online and in-store customers of GameStop in the US and EB Games in Canada, but we'll keep you posted if it reaches anywhere else. Scribblenauts hits North America on September 15. EDIT: Looks like it'll be hitting EB Games in Australia too. Hooray! That's what that thing is? maxwell cosplay wonder if you can call up a rooster hat? lol wouldn't really be useful though. OMG that's pretty awesome. Might have to pre-order the game now, seems like it'll be a barrel of fun. 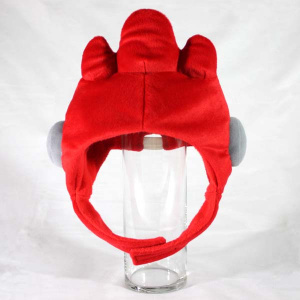 A Scribblenaut hat, now that is gonna be popular. Get moving people! I'm glad I waited to preorder! @ZakSaturday Me too! I was about to go out and pre-order it, and then...BOOM! Rooster hat awesomeness strikes! I went to GameStop to pre-order this and Metroid Prime Trilogy immediately after the announcement. Woohoo!!! That is freaking awesome! I'm glad I already have my copy of Scribblenauts reserved! Oh my god. I want that. @Charlie Hope we both win one. Whoever wears that deserves a wedgie of epic proportions. Sweet, we can all go as Chicken Brutus for Halloween! I wonder what dirt he has on Iwata that got him this great homage. I wish... I knew this before I blew my cash on WSR... Oh well. Next week. So we have to buy it from EB to get the hat? It looks cool, but not worth the extra $20 - $50 depending on what deal JB HiFi do. The hats better be in stock by the time I get the money to preorder! That hat is a collectors item. @WolfRamHeart: Yes, the hat (and game) look fun-tastic.... but all I want to say is -- love the name. Angel 4eva! NOOOO I MISSED THE PRE-ORDER!!! !